Hard work, you have to do the work to produce the results. You have to have a good product, whether that product is a service, it must be good. By good, I mean it has to deliver on what it says in an exceptional way. Finally, timing. The market, your consumer, how it impacts and the value of it depends on the timing. Taking these three together creates the perfect mix for any venture in any field. Looking at these in reverse ..a fun example on timing, you want to open an ice cream shop and try to sell in the middle of a blizzard. You’re probably going to be unsuccessful, no matter how hard you work or how great the ice cream is. However, if you opened a soup store or had a soup product in the winter, you would do exceptional. A good product must give value to the consumer. Often people will sell crap products and have gotten away with it for centuries. Today with the internet, with transparency in product, with the speed of consumer feedback and the different social media platforms, being able to swindle people has become much harder thankfully. The better products will rise at the top, that doesn’t mean that there’s going to be one product for everybody. In fact because there is so much distribution, a good product might be perfect for a specific demographic. The long tail is extremely valuable and available now, which wasn’t available. You can have an exceptional product that needs a very specific demographic and therefore live in a marketplace where there is a abundance of providers, products that is similar to yours. Finally, hard work. You need to put in the time, you need to do the right work in the right timing, delivering the value and continuing. That’s where time comes in, that’s where the trade of value comes in. That’s where you work with people and your team in order to deliver and create those products and bring in to market. 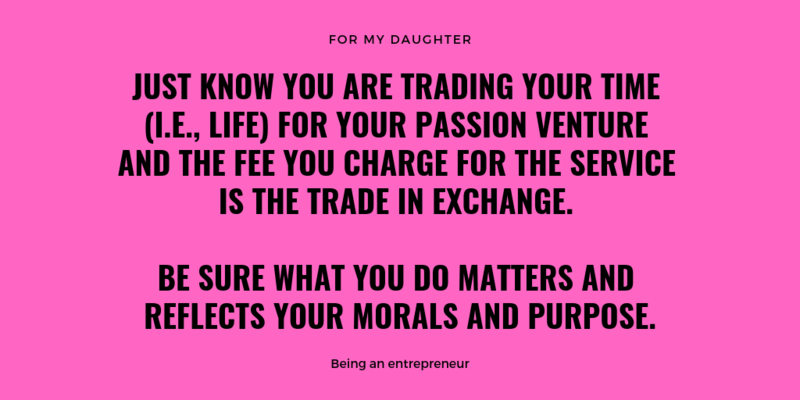 Just know you are trading your time (i.e., LIFE) for your passion venture and the fee you charge for the service is the trade in exchange. Be sure what you do matters and reflects your morals and purpose. Then enjoy the journey — think years not months and decades not years in your milestones. What you build will last and create an impact that serves you, your name, and our world well. That’s it, that’s how to be an entrepreneur. That’s what it takes. Previous post: Does your CEO know you are still using servers in the Cloud?